I attended the Spring Regional Day for Quilters’ Guild Region One. In the morning Kate Findlay spoke about her work in textile and quilting. She had a series of work about the Hadrons, space, atoms. She used different kinds of fabrics from shiny fabrics, beads, sequence, leather, wires and cottons. Another speaker was Christine Porter, who spoke about her work and books. She told us how at the age of 43 decided to be a quilter. She travelled around Britain and the world teaching her experience in quilting like United Arab Emirates, Kuwait, cruises. She has been invited to America and others countries around six times a year. I visited the Knitting and Stitching Show in Olympia. It was a day of inspiration, which made me happy to spend money on fabrics, beads, paints, ribbons, books and magazines. Also there was a section for Quilting Guilds and this year’s theme was traditional quilting. 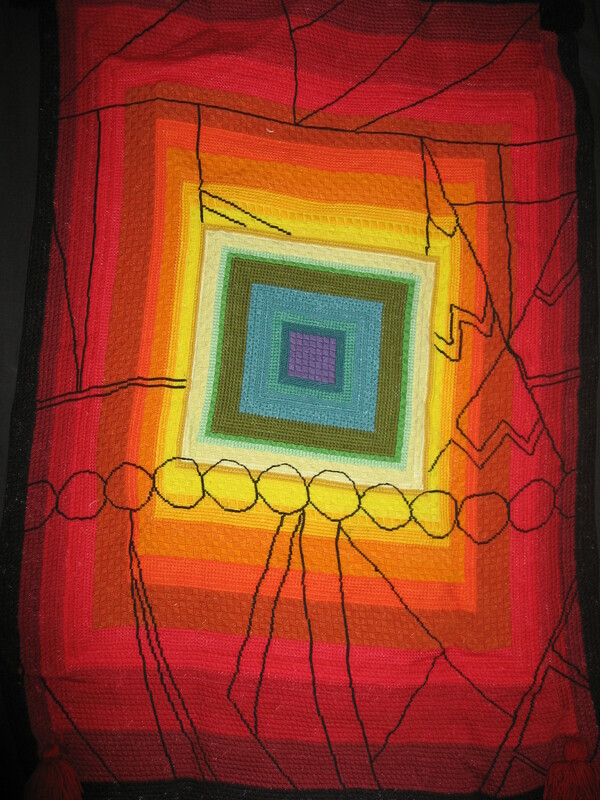 I finished this wall hanging in November 2004. I didn’t like it and put it away. This month I hung it in the living room and every time I see it I wonder what to do with it. I have two ideas in my mind: first to cut it to four pieces and make four bags or cut it to many squares and make another hanging from it. If you have any other ideas please leave a comment! I am so glad to be invited, for the fifth time, to the Iraqi celebration in Imperial College. I showed my Piece for Peace wall hangings, which are increasing in size. On the day of the celebration I got these pieces to add.